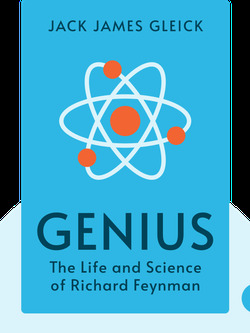 Genius (2011) charts the life and career of brilliant physicist Richard Feynman, from his formative upbringing to his remarkable and lasting contributions to science. Though he’s not as renowned as Albert Einstein, and has no groundbreaking theories to his name, Feynman did change the way scientists look at the world. As a child, Richard Feynman was encouraged to think scientifically. Before Richard Feynman was even born, his father, Melville, made a prediction: if the unborn child turned out to be a boy, he’d become a great scientist. And sure enough, the prophecy came true – but this had a lot to do with how Richard was raised. Melville was a second-generation European immigrant who’d settled in upstate New York. Though he had scientific aspirations, he felt that, as a middle-class Jew, his options were limited. So instead of pursuing his own dreams, he worked as a salesman and pinned his hopes on his son. As a result, Richard was raised to see the world with a scientific mind. Before Richard could even talk, his father stimulated his son’s developing mind with tiles that contained blue-and-white geometric patterns. Later, Melville would take Richard to museums and translate the facts and numbers on display into images that allowed his son to visualize, and therefore retain, the details. So, when describing a Tyrannosaurus rex, he told Richard that the dinosaur was tall enough for its head to reach his bedroom window, but that the head would be too wide to fit through it. Melville also made sure Richard understood how and why things work – and how important this understanding is. One day, on a mountain hike, Melville asked Richard to identify each bird they encountered. Whenever Richard was stumped, Melville would recite the bird’s name in Chinese, Portuguese and Italian. This may seem like mere showboating, but there was a larger point. Depending on where you are, different people will have different names for the same bird, names that tell you nothing about the bird itself. Real knowledge comes from observation and an understanding of what the bird actually does. Much later, Feynman shared this insight while working on a school advisory board for science textbooks. The textbooks were written in vague language, such as this: “friction causes shoe soles to wear away.” Feynman pushed for more detailed explanations, such as “the grooves on a sidewalk grip chunks of shoe leather and tear them off.” It infuriated him that children were being taught unscientific information that didn’t include how things actually happen. Feynman won math competitions using the same methods he would later apply to complex physics problems. At college, Richard’s obsession with physics became all-encompassing. In 1942, Feynman joined the Manhattan Project and led a team that helped build the atomic bomb. Feynman’s method of visualizing problems helped win him the Nobel Prize. The few classes that Feynman taught became legendary among students and professors. Feynman cultivated a reputation as a joker, but his legacy is that of a truly original thinker. Start your free Blinkist trial to get unlimited access to key ideas from Genius and over 3,000 other nonfiction titles. With bitesize text and audio, it's easier than ever to find the right ideas to transform your life.